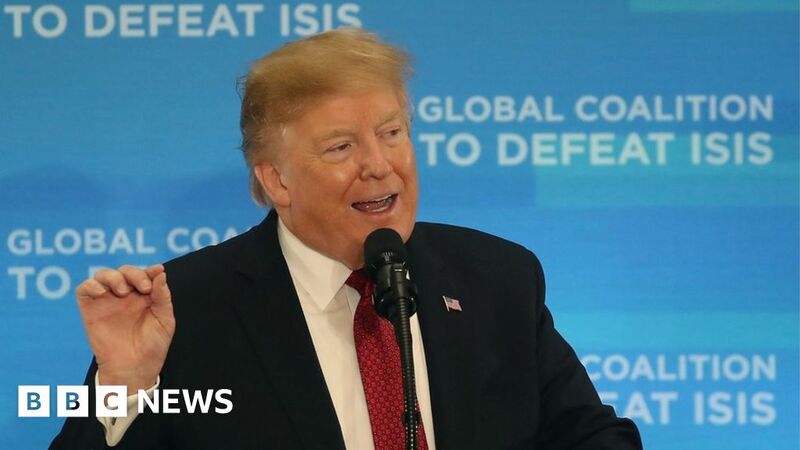 US President Donald Trump has said territory held by the Islamic State group in Syria and Iraq could be “100%” liberated as early as next week. “It should be announced, probably some time next week, that we will have 100% of the caliphate,” he told a gathering of coalition partners. However, he also cautioned that he wanted to “wait for the official word”. US military and intelligence officials say IS could stage a comeback without sustained counter-terrorism pressure. Mr Trump shocked coalition allies in December when he declared that the group had been defeated, amid reports he wanted to pull out US soldiers within 30 days. But he later slowed the withdrawal after several resignations from key defence officials and strong criticism from Republicans and allies abroad. The global coalition against IS, now numbering nearly 80 nations, was formed in 2014 after the group overran swathes of territory and went on to launch terror attacks outside the region. How does Trump view the battle against IS now? But the group still had “tiny sections that can be so dangerous”, he said, and “foreign fighters must not gain access” to the US. He also referred to the IS propaganda machine, which recruited fighters from Europe and other regions. Secretary of State Mike Pompeo pledged the US would continue to fight IS, despite withdrawing troops from Syria. He called the troop pullout a “tactical change… not a change in the mission”, and said the world was entering an “era of decentralised jihad”. Has IS really been defeated? It has certainly lost control of most of the territory it overran, including its strongholds of Mosul in Iraq and Raqqa in Syria. On Tuesday the head of the US military’s Central Command, Gen Joseph Votel, told a Senate committee up to 1,500 IS militants remained in a 20 sq mile (52 sq km) pocket on Syria’s border with Iraq. The group, he said, still had “leaders, fighters, facilitators, resources and the profane ideology that fuels their efforts”. Meanwhile, a report by a US defence department watchdog cited Central Command as saying that without sustained pressure IS “could likely resurge in Syria within six to 12 months”. Another challenge is what to do with the hundreds of foreign fighters captured by the SDF, as well as their families. Governments in their home countries are reluctant to take back radicalised militants who swore allegiance to Islamic State. How will an IS comeback be stopped? President Trump’s comments were more than a month late, as he did not consult his allies about his decision in December to withdraw US troops from Syria. The shock from the surprise announcement has settled, but coalition members want to know how this is going to play out. It’s not clear that the administration has sorted that out. Both Mr Trump and Mike Pompeo called on other nations to take on more commitments for the continued campaign against the IS group, but said they were still in the fight – America would continue to lead it, Mr Pompeo said. Mr Trump had previously suggested that some of the troops in Syria could be moved to American bases in neighbouring Iraq, from where they could launch commando operations across the border as necessary. But there are still no official details about how the US will continue the counter-terrorism pressure Mr Trump’s generals and intelligence officials have said is necessary to stop IS militants from staging a comeback.